A key development in this direction was the signing of a linking agreement in May between the Bulgarian and the Romanian central depositories that allows dual listings of companies from the two countries on both stock exchanges. Several Bulgarian companies have already expressed interest in a possible listing on the Romanian bourse, Vasil Golemanski, CEO of the Bulgarian Stock Exchange (BSE), told a news conference. The two bourse operators, the Bucharest Stock Exchange, BVB, and the Bulgarian Stock Exchange (BSE), are also considering creating a joint share index. According to Georgi Balgarski, a member of BSE’s management board, the index could track 10 Romanian and five Bulgarian companies, as BVB’s turnover is 10 times bigger. Seven indices track companies listed on the BVB, compared to five on BSE. The signing of the linking agreement could boost liquidity, BSE’s other CEO, Ivan Takev told SeeNews. In his view, however, the development of the BSE in the short and medium term will largely depend on individual investors. “The factors [that will set the stock exchange’s course] are both local and regional but it all comes down to the individual investors, I think they will determine the development of the market,” Takev said. Takev said one reason for the absence of individual investors from the local bourse compared to the pre-crisis years is high interest rates on relatively risk-free bank deposits. “Although Bulgaria’s economy has been growing for several consecutive quarters, on micro level individual companies still feel uncertain about the environment,” he said, adding that individual investors will return to the bourse as soon as they see clear improvement. The state can play a key role in such a long-term strategy by privatising state-owned companies through the bourse, Takev added. The Bulgarian Energy Holding (BEH), for one, is of particular interest to all market players because of its size, he said. It incorporates assets of Bulgaria’s sole nuclear power plant Kozloduy, gas monopoly Bulgargaz, gas transmission system operator Bulgartransgaz, telecommunications operator Bulgartel, National Electricity Company and its wholly-owned system operator Electricity System Operator, coal-fired power plant Maritsa East 2 and the Maritsa East coal mines. The government has said it is considering putting up for sale a stake in BEH but according to Takev so far no details have been discussed with representatives of the stock exchange. In neighbouring Romania, several new flotations of state-held stakes planned for this year are expected to bring a breath of fresh air, boosting liquidity and trading volumes on the market. “The planned initial public offerings will probably be the most important events on the Romanian bourse this year. They will increase the liquidity and the trading volumes, and boost visibility,” the head the Bucharest bourse management board Lucian Anghel told SeeNews. Romania plans to list minority stakes in key energy and transport companies in 2012, as part of its commitments under a two-year precautionary stand-by deal signed with the IMF last year. The planned initial public offerings (IPOs) include a 10% stake in power producer Nuclearelectrica and a 20% stake in flag carrier Tarom. Romania also plans a secondary public offering (SPO) by the end of 2012, in which it will put up for sale a 15% stake in gas transmission company Transgaz after successfully completing an SPO of a 15% stake in power grid operator Transelectrica earlier this year. Transelectrica’s SPO, held in March, was 58.8% oversubscribed, signalling strong investor interest. “I think the chances for successful SPOs in the future increased dramatically, because Transelectrica’s stake listing was the first SPO in more than three years. Now I am sure that the next one will be even better,” Anghel said. The only public offering held on the BVB last year was the SPO of a 9.84% stake in Romania’s top oil and gas group, OMV Petrom. The offering failed as the subscription rate was lower than 80%. Hit by low liquidity, the operator of the Belgrade stock exchange too turns a hopeful eye to the sale of state-held stakes. 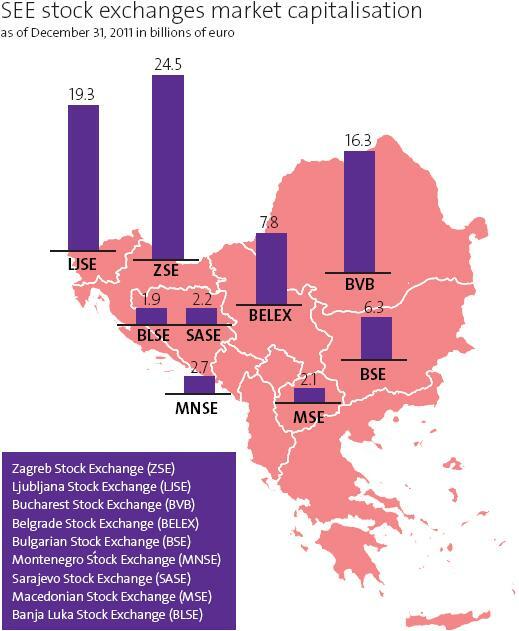 When talking about international and regional cooperation, the Belgrade Stock Exchange stays active in the initiatives that are expected to bring positive results for the local market and increase interest of foreign institutional investors in the region. Along with seven bourse operators in the region – in Banja Luka, Ljubljana, Podgorica, Sarajevo, Skopje, Tirana and Zagreb – it signed in March an agreement for a platform of joint action. The objectives of the agreement are to achieve the synergy of joint activities that will lead to easier, more direct and more economical access of investors to regional markets, as well as creating a leverage of economic development in the region, the Zagreb bourse’s CEO Ivana Gazic told SeeNews. She described the platform, which is supported by the Regional Cooperation Council and USIAD’s Partners for Financial Stability programme, as “the starting point for future cooperation”. strength and potentials of the regional capital market,” Gazic said. She, however, added that for the time being building any other form of cooperation would mean overcoming regulatory, technical and other significant obstacles. “The gradual convergence of markets will continue to be carried out by defining and achieving specific and feasible tasks, but achieving the very challenging goal of the highest degree of regionalisation in the long run requires a comprehensive work of all constituents of the capital markets, including relevant state authorities, regulators as well as the business sector itself,” Gazic said. Commenting on the development of the Zagreb bourse, Gazic said that while macroeconomic stability of the country has been achieved and the worst of the recession is probably over, structural reforms lag and the concern still remains as Croatia is yet to see the signs of a sustained economic recovery. Further government actions will be essential to induce the recovery of the domestic capital market, especially regarding further privatization of public enterprises, she stressed. “The Zagreb Stock Exchange will continue its work on encouraging issuers to raise capital through the stock exchange, developing new products and services such as short selling and certificates, maintaining market integrity and investors’ confidence as well as providing a reliable mechanism for funding the growth of Croatian economy and raising awareness about the importance of capital markets as one of the most significant factors in economic development,” she said. In Slovenia the Ljubljana Stock Exchange (LJSE) too has been experiencing a clear negative trend from 2009 onwards as a result of negative domestic retail sentiment, problems with liquidity of domestic institutional investors, low volume and bad economic and business results of some companies. Looking for solutions, the LJSE together with capital market participants drew up a strategy for the development of the capital market. The areas of special national significance put forward by the strategy include: all forms of saving for old age – “P accounts” as the third pillar pension system solution, improving the capital structure of Slovenian companies, improving corporate governance, balancing the state’s ownership role and strengthening the international competitiveness of Slovenia’s financial sector. “In 2011 all these proposals were publicly discussed and we expect that the key solutions will be implemented in future reforms,” LJSE Board President Andrej Sketa told SeeNews. The strategy has already resulted in tangible improvements such as more active integration of the Slovenian market into international markets with the further integration into the CEE Stock Exchange Group and with the introduction of the Xetra trading system, he added. “[…] we can all achieve much more by working together rather than working on our own,” Sketa said. Since 2008 LJSE has been part of CEE Stock Exchange Group, which represents the largest capital market in central and eastern Europe with a market capitalisation of 115 billion euro and total half-yearly equity turnover of 40 billion euro. A total of 178 international and local financial agents operate within the CEESEG market. 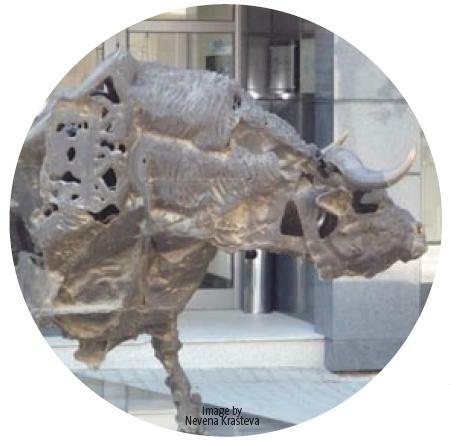 The Slovenian bourse has cooperated for many years with the other SEE stock exchanges, as well. “To consolidate our profile in the region and give new momentum to the campaign to encourage cooperation among the stock exchanges of Southeast Europe we entered into another Memorandum of Partnership with SEE exchanges this year. The cooperation is in the field of promotion activities and development of infrastructure of the capital market of Southeast Europe,” Sketa said, adding that the Ljubljana bourse is looking forward to further cooperation within this framework.